Ask a question about 605 Calle De Peru, or schedule a tour. Welcome to Siesta Key Village! Location, Location, Location! 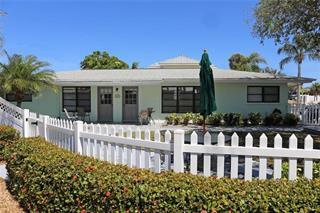 I am proud to present a completely remodeled DUPLEX located on a beautiful corner lot in the HEART OF SIESTA KEY VILLAGE. This is a RARE OPPORTUNITY for an investor to acquir... more.e an UPDATED INCOME PRODUCER without any prior rental obligations in place and in walking distance to countless (tiki) bars & restaurants, funky souvenir shops, island boutiques, ice cream shops, fine dining and - of course - the WHITE POWDER SAND BEACHES of the NUMBER 1 BEACH in the country, Siesta Key Beach! There are two units (2BR/1BA and Studio/1BA) that have undergone a major renovation, including brand NEW KITCHENS with high-quality QUARTZ COUNTERTOPS and NEW APPLIANCES, NEW BATHS, NEW FLOORS and NEW HURRICANE IMPACT WINDOWS. This lovely property sparkles like a gem and is ready for tourists. Alternatively, discriminating buyers dreaming of their own slice of island paradise are able to move right in and rent out the studio for income now and enjoy the potential to build their dream home later. 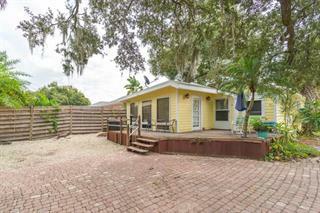 The property also boasts a HUGE & SHADY FENCED-IN BACKYARD with plenty of room for a sparkling pool, a hot tub, outdoor kitchen and furniture. 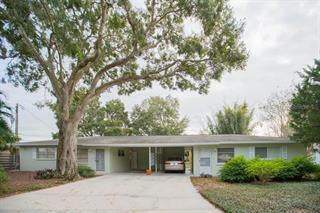 The corner lot provides ample room to create a lush tropical oasis on the sides of the house. The opportunities are endless. There is no need to look any further. Put this property on your short list and come and see it soon. Did I mention Location, Location, Location? Well. Paradise. Found.